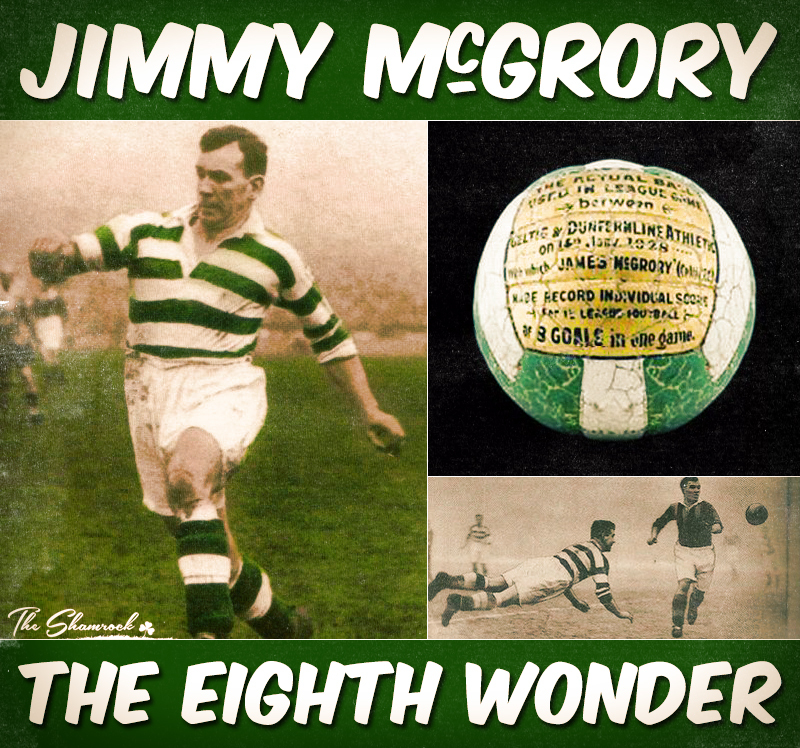 Jimmy McGrory – The Eighth Wonder! There were four thousand fans in attendance at Celtic Park on 14th January 1928 for a Scottish League tie against Dunfermline Athletic. Just two weeks earlier almost seventy thousand were in the old ground to witness Celtic beat Rangers in the traditional New Year’s Day fixture, thanks to a goal from Jimmy McGrory. The Garngad bhoy was in a truly rich vein of goal-scoring form: two days after the Rangers victory he scored a hat-trick of goals away to Queen’s Park and did the same the following Saturday at Falkirk, Celtic recording 3-1 wins in each game. Those four thousand lucky souls who decided to take in the Dunfermline game were to witness scenes in Paradise that would never be repeated. Jimmy McGrory wasted no time in laying waste to the Dunfermline defence. 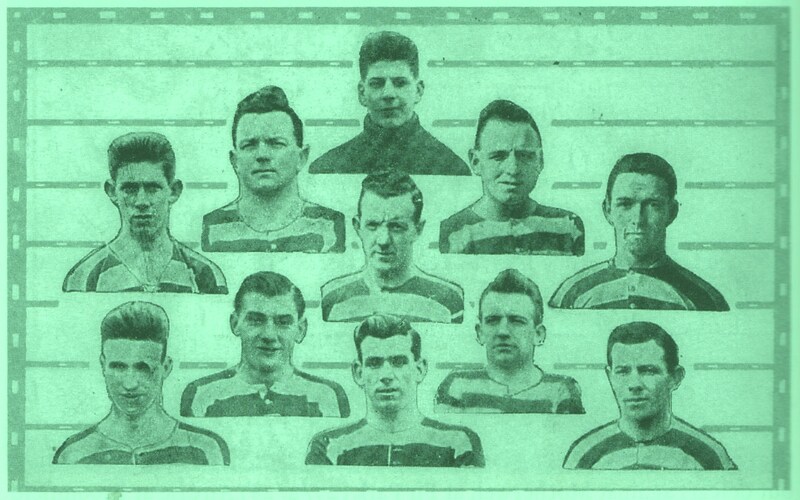 The title race that season involved Celtic, Rangers and Motherwell and McGrory’s incredible scoring rate was being relied upon heavily by Willie Maley’s team to maintain their challenge. Dunfermline were to record only 12 points in the league all season and ship an incredible 126 goals while finishing in the bottom spot: McGrory could smell blood. He had some able assistance. His friend John Thomson kept goal and the defence was led by captain Willie McStay with Peter McGonagle his fellow full-back and wee brother Jimmy McStay holding the centre with support from Peter Wilson and Frank Doyle. 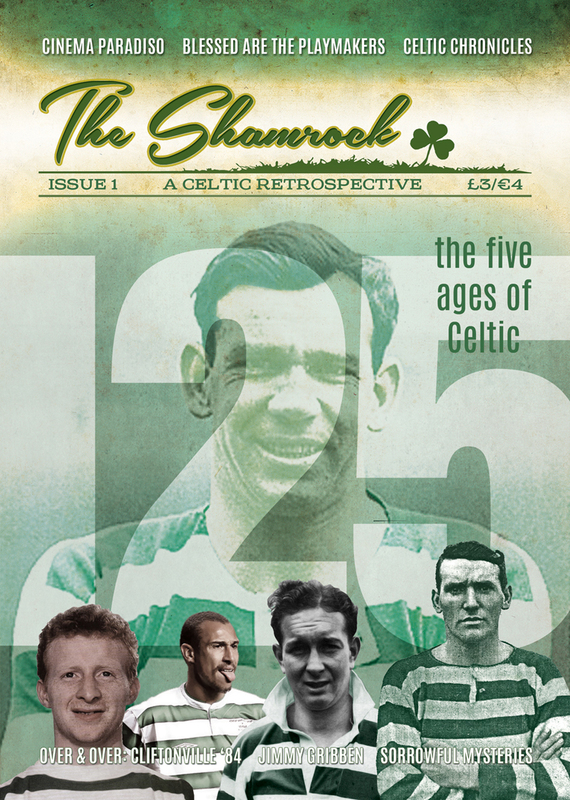 The five man front-line had the trickery of Tommy McInally and Alec Thomson while Paddy Connolly and Adam McLean used the width of the wings to feed the spearhead at centre-forward: McGrory. The rain poured down on Celtic Park from before kick-off. With just one minute on the clock and following “delightful play” between Frank Doyle and Paddy Connolly, the latter sped down the right wing “and his accurate low centre was met by M’Grory who fired it hard into the corner of the net.” One Nil Celtic. It was a dream start. 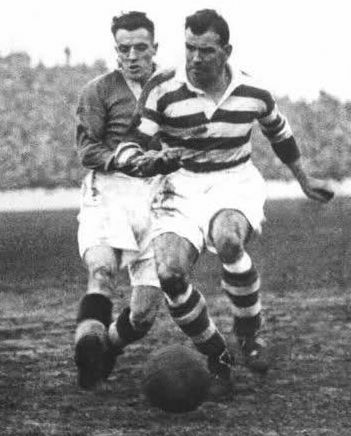 Just three minutes later the clever Connolly again found McGrory in space and this time, “shaking off the challenge of the opposing pivot” he left goalkeeper Harris helpless with a similar shot. Two Nil Celtic. Already the home support had a lot to cheer about. 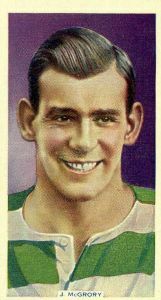 Before the ninth minute of the game was complete McGrory was again on the scoresheet. He was already nicknamed The Human Torpedo because he could head a ball more powerfully than many mere mortals could kick it, even though he stood at only 5ft 6 inches. From yet another Connolly cross a trademark McGrory header “flew off Jimmy’s cranium” and Harris could only parry the sodden heavyweight leather-laced ball on its way across the line. 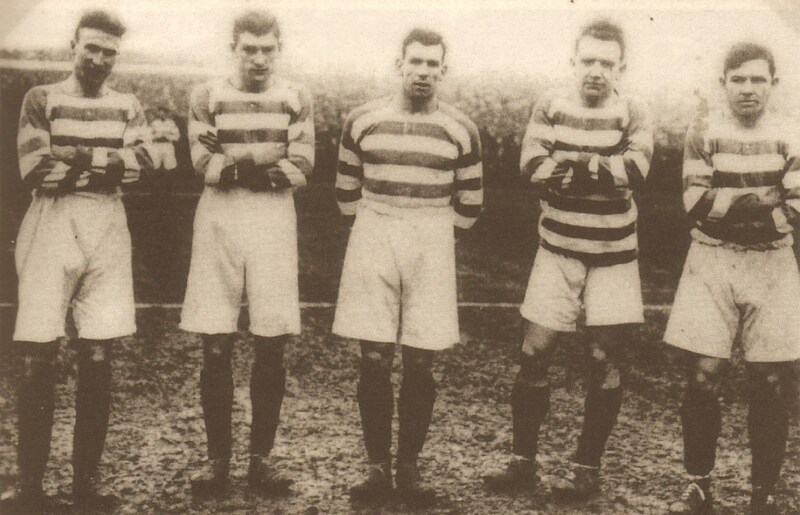 Three Nil Celtic – with only nine minutes gone and all three goals coming from McGrory, each “due to the brilliance of Connolly.” (Incredibly, this wouldn’t be the fastest hat-trick McGrory would achieve: in 1936 he scored a hat-trick in just three minutes against Motherwell and he still holds the British record for career hat-tricks – 55 in total). With three already netted, Dunfermline were now acutely aware of McGrory’s danger and decided to police him heavily: “an unwanted cordon of blue shirts escorted him at every turn” reported one newspaper. On the 21st minute McGrory broke through that cordon, steered the ball into space and hooked a glorious shot into the net for his fourth of the game. Four Nil Celtic. It was The Jimmy McGrory Show and with the Dunfermline half-backs and full-backs all trying to patrol McGrory it created space for his colleagues to play in. Three minutes before half-time Alec Thomson “waltzed past three opponents and scored”, giving Celtic an unassailable lead going into the break. Five Nil Celtic. The excitement in the crowd reached “fever-height” in the 60th minute when yet another McGrory shot evaded Harris and the Dunfermline net bulged for the sixth time. Six Nil Celtic. Only one goal was needed in the last half-hour to equal the record – surely he would do it? Within two minutes McGrory answered in the positive. A clever pass from Adam McLean released the Garngad man to score his sixth of the match. Seven Nil Celtic. One newspaper reported that “the spectators almost went wild with jubilation.” Little wonder, they had just witnessed history in the making. And with 27 minutes still remaining could he go further and actually smash the record? McGrory and his team-mates weren’t satisfied with the eight-goal margin. Five minutes from the end McGrory again beat Harris with yet another shot, prompting more scenes of joy on the terracing: “A tempestuous babel of applause from the crowd greeted the centre when he came along with the eighth to equal the highest scoring record in football.” Nine Nil Celtic. At full-time the adoring support flooded on to greet McGrory but “the modest hero evaded an army of admirers, who cheered lustily.” Even they couldn’t catch him. Eight goals. In a single game. 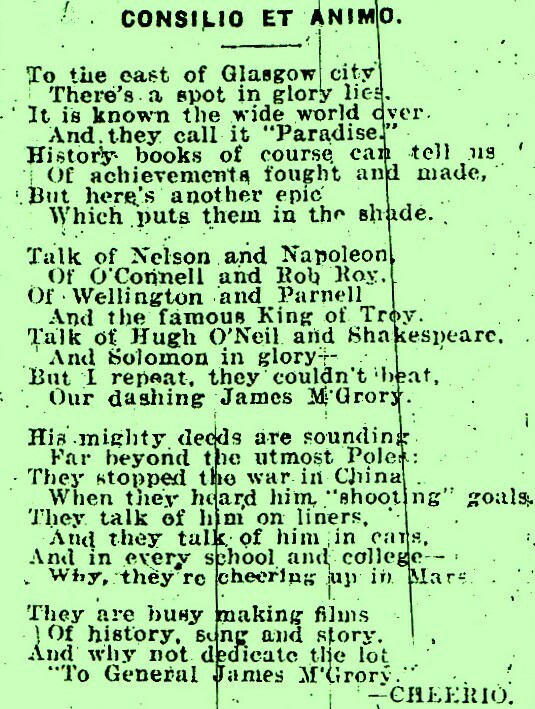 It is little wonder that, even today, some Celtic fans refer to Jimmy McGrory in reverential tones. 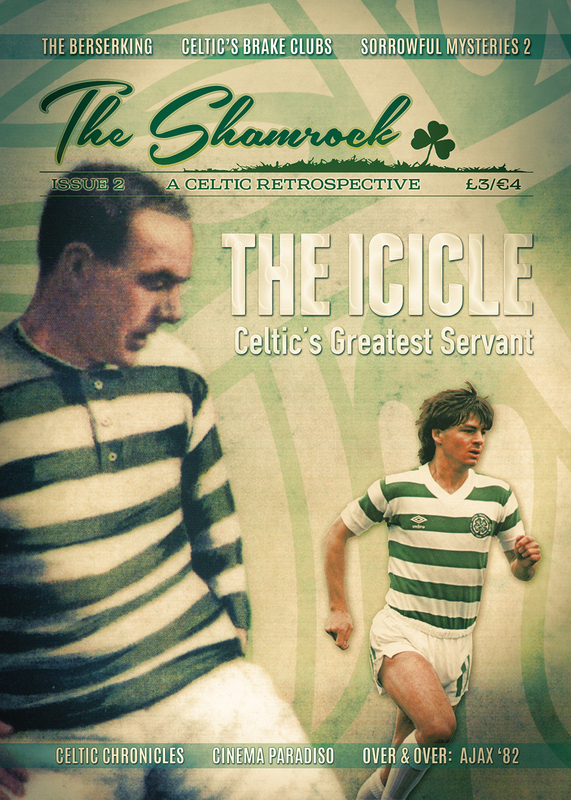 He was the supreme striker – not just for Celtic; not just in Scotland. Decades after his playing career ended many of the records he created remain unbeaten to this day. Those eight goals against Dunfermline are still a British record for a top-flight football match. The goals he scored in that 1927-8 season, 63 in total across all tournaments, remain a joint British record (with Dixie Dean of Everton). That achievement places the Garngad man in joint sixth place in European rankings for most goals a season. The record was his and his alone. 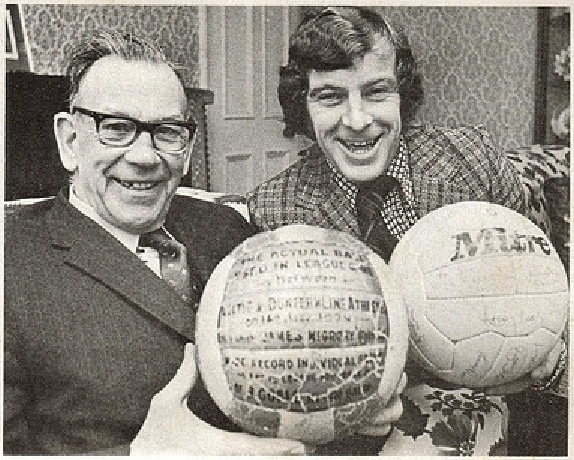 Famously unassuming, Jimmy McGrory took pride in his record-breaking achievement, saying not long before his death: “It’s a record of which I am rather proud and I still have the match ball in my home which was later given to me by Willie Maley who for many years displayed it in his Bank Restaurant in Queen Street.” Today the ball, painted in record of the achievement, is on permanent display at the Scottish Football Museum at Hampden Park – along with the last pair of McGrory’s size six football boots, left in the care of Celtic trainer Jimmy Gribben when the striker left to take up the post of Kilmarnock manager in late 1937. 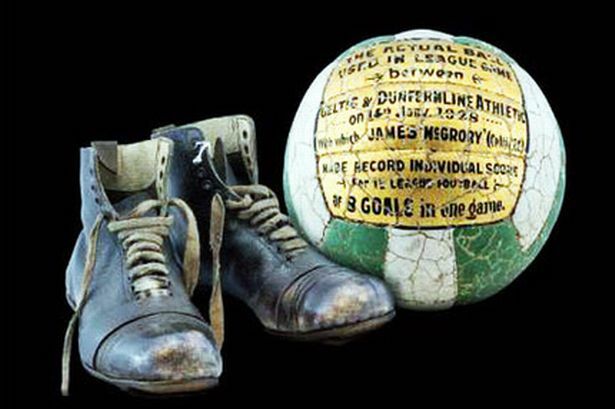 Those few thousand Celtic supporters who watched him score eight goals that rainy day in 1928 witnessed the birth of the legend of Jimmy McGrory. The legend – as with the records he created – will go on forever and ever. For Celtic fans he remains the Eighth Wonder of the World.